The Second World War was a turning point following which design in Slovakia developed under different conditions. After the Communist Party assumed a monopoly of power in the recovered Czechoslovakia, Slovakia experienced massive industrialisation, but production was predominantly orientated towards quantitative aspects, while inadequately preferring heavy industry. The principles of market mechanisms driving the development of design, particularly competitive pressure, were absent. The internal environment of the Czechoslovak economy was determined by monopoly producers and exports were directed mainly towards the east, where the majority of Czechoslovak products were without competition. Emphasis on innovative processes in production was also absent. Gradual technological leeway did not allow the implementation of many interesting design solutions which were mainly presented at various competitions and exhibitions. Many of them only ended up as unimplemented prototypes. 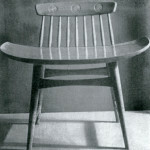 Design thus reached the position of a platonic profession which was formally supported by official ideology (quality design was seen to contribute to the multilateral satisfaction of growing material and spiritual human needs, which was one of the basic objectives of a socialist society), but which in reality only meant an unnecessary load on a deformed economy. Utility graphics formed a partial exception, while those areas that were usable in political propaganda were preferred and massively supported. Problems in the professional career of designers often resulted in their resignation from co-operation with industrial production and in their ‘escape’ to free creative art disciplines, the moral and financial assessment of which was higher. The quality standard of design in industrial production was only successfully maintained by a few producers who concentrated on exports to industrially advanced countries, or in enterprises with ‘progressive’ management. Slovak designers thus had no appropriate conditions for the implementation of their design ideas. 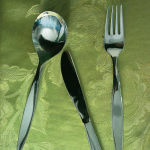 The few cases of actually implemented co-operation during the 1950s, especially the operation of Karol Holosko at the United Glassworks in Lednické Rovne (utility glass production) and the operation of Jan Calovka at Sandrik Dolné Hámre (cutlery and metal tableware), brought results comparable with the advanced world level. Along with the above, the furniture designers Viktor Holestak-Holubar and Frantisek Jirak must also be mentioned, as well as Igor Didov who concentrated on several spheres of industrial production. Graphic design was generally narrowed down to poster production with an emphasis on political posters. The long-term co-operation of Cestmir Pechr with the Slovak National Theatre (SND) was also exceptionally productive in the area of theatrical posters. Among the more universally oriented graphic designers, Vlastimil Herold, Drahomir Mrozek and Alojz Riskovic must also be mentioned, and the production of the latter designer in particular met the most demanding creative criteria.